When Should I Exercise While Fasting? Intermittent Fasting is a dieting trend you might want to try in the new year! One question you might have before starting this lifestyle is, “When should I exercise while fasting?”. Well, Lindsay Boyers, author of THE EVERYTHING GUIDE TO INTERMITTENT FASTING, gives you the rundown on this! There’s a long-standing debate in the fitness world about whether it’s better to work out on an empty stomach (a fasted state) or a full stomach (a fed state). The answer is that it depends on the intensity of your exercise. 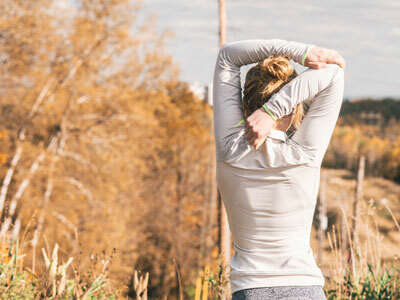 There are many benefits to exercising in a fasted state, but if you’re an endurance athlete or engaging in high-intensity exercise, working out after eating may be better for you. When you exercise, your body demands an increased amount of energy. First, your body will turn for fuel to glucose in the blood. When that runs out, it starts burning glycogen—the form of glucose that’s stored in the liver. In general, your liver stores enough glycogen to sustain your body’s energy needs for twenty-four hours in the absence of food; however, the increased energy demand that exercise puts on the body will result in a faster depletion of glycogen. The amount of glycogen that gets used up depends on the duration and the intensity of the exercise you’re doing. Once glycogen is depleted, your body switches from burning carbohydrates for energy to burning stored fat. Your body’s ability to burn fat is controlled by your sympathetic nervous system, which is turned on by both fasting and exercise. When you combine the two, it maximizes the physiological processes that break down fat for energy. Unlike glycogen, which is only stored in limited amounts, fat can be stored in your body in unlimited amounts, so you never run out. Your muscles will eventually adapt to using whatever energy source you give them. One study published in the International Journal of Sport Nutrition and Exercise Metabolism placed nineteen men into each of two groups. The first group of men engaged in aerobic exercise (cardio) in a fasted state, while the second group of men did their cardio in a fed state. During each exercise session, the participants had their measurements taken, filled out a food questionnaire, and provided blood and urine samples. After the study was concluded, researchers discovered that while both groups of men experienced weight loss, only the men in the fasted group lowered their body-fat percentage. In other words, while the men in the fed group lost weight, they still had the same relative amount of body fat. Fasting and exercise also put a good kind of stress on your body, which makes your muscles more resilient and helps counteract the effects of muscle aging. When this stress is put on your body, it triggers the release of brain-derived neurotrophic factor (BDNF) and muscle regulatory factors (MRFs), which send messages to the brain to create new neurons and which trigger the muscles to make new muscle cells. This cascade of events does much more than help you lose fat or build muscle: the release of BDNF and MRFs, and the resulting creation of new neurons and muscles cells, can keep your brain, neurons, and muscle fibers biologically young, boost brain function, prevent depression, boost testosterone levels, and increase levels of growth hormone in the body. 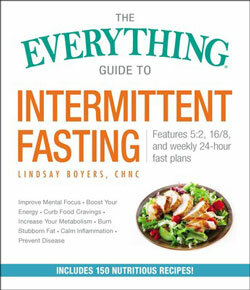 Find out more tips being healthy and fit in THE EVERYTHING GUIDE TO INTERMITTENT FASTING by Lindsay Boyers! Excerpted from The Everything Guide to Intermittent Fasting by Lindsay Boyers. Copyright © 2018 by the author. Used by permission of the publisher. All rights reserved. Photo by Jacob Postuma on Unsplash. Learn all about intermittent fasting with this comprehensive guide—from its health benefits to how to safely implement fasting into your life and diet—with 100 recipes for nutrient dense foods and meals under 500 calories. Intermittent fasting involves alternating cycles of fasting and eating, all within a set time schedule. Think of it more as a pattern of living and eating than a diet. Because unlike diets, there aren’t any strict rules on what you can and can’t eat—intermittent fasting is all about timing! Recently, many scientific and medical studies have pointed to the benefits of intermittent fasting, from its weight loss results to its impact on disease. Share When Should I Exercise While Fasting?